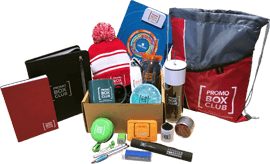 The Promo Box Club is a marketing resource specifically designed for businesses and marketing professionals who use promotional products to target key clients, prospects and employees. Every other month, we’ll send you samples of new, innovative, and tried and true promotional items. 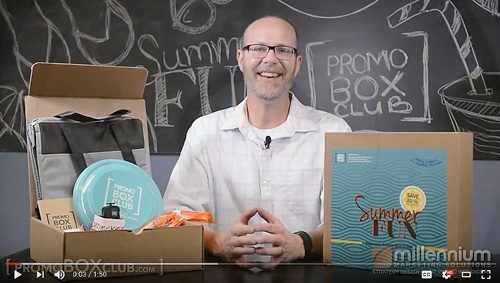 We have some great promotional products to help you boost trade show traffic in this version of the Promo Box Club. Watch here. Choose from monthly, yearly, and VIP Membership plans custom tailored with the hottest new promotional products. When your PromoBox arrives, explore your new products and the included product info card for marketing suggestions and ordering information. You can also visit our blog and follow us on social for more ideas! You can order any product that you like directly on our NEW online store. Get inspired and shop now. The right promotional products will make a lasting impression. Not only will your customers remember your company, but that cool gift that you gave them will help cement your brand into their memory. You’ll receive exciting promotional products and print samples, giving you fresh ideas for your marketing, sales, and events. In addition to samples, we’ll deliver marketing tips, and advice from industry experts. Members receive special pricing and discounts on monthly items. You can easily order your favorite product online. Are a promotional product buyer, marketer, meeting planner, recruiter, sales team member, and/or business owner. Want to be inspired with new trendy ideas to make your marketing and business successful! Exhibit at trade shows, recruiting events, and conferences. Buy gifts for your clients or employees. "I don’t like when people refer to promo products as tchotchkes, trinkets, or trash. They are powerful marketing tools that have a lasting impact when used correctly." Improve Your Marketing Game. Sign up for the Millennium Marketing Solutions Newsletter!